JASPER COUNTY, Ind. (WLS) -- An Indiana state trooper was seriously injured after a semi crashed into his police car in Jasper County, Indiana. A 25-year-old state trooper was heading west on State Road 10 around 5:20 a.m. Wednesday when Indiana State Police said he turned on his emergency lights and made a U-turn just east of CR 1100 West to go after a violator. A 2000 Volvo semi was also heading west on State Road 10. Investigators said the 75-year-old driver was unable to avoid the trooper's 2008 Crown Victoria. The semi hit the driver's side door of the police car and pushed it into the eastbound lanes of State Road 10. The trooper was trapped inside the car and had to be extricated, state police said. He was airlifted to Advocate Christ hospital in Oak Lawn, Illinois. He suffered serious lower extremity injuries, but they were not life-threatening. The semi driver was not injured. The semi, owned by Wm. O. Hopkins Inc. out of Rensselaer, Ind., was pulling a box trailer loaded with 20,000 pounds of empty wooden spools. It was heading to Itasca, Ill.
State Road 10 is closed east of I-65 for crash reconstruction and cleanup. 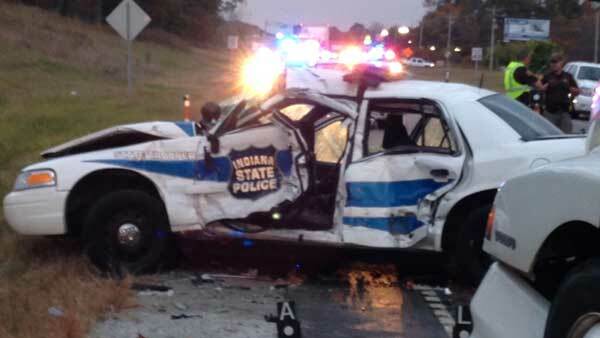 An Indiana state trooper was seriously injured after a semi crashed into his police car in Jasper County, Indiana.